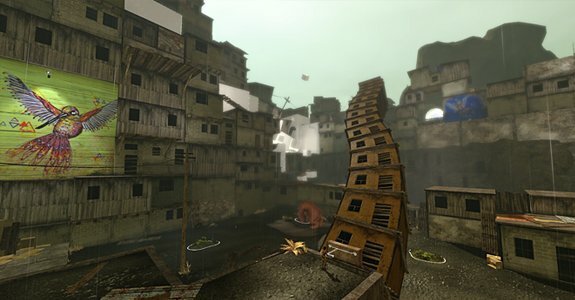 Papo & Yo is a title that had me interested from the first time I laid eyes on it. Staring a scrawny little boy and what looked to be his pet monster, working together in an interestingly artistic take on a run down, third world area; it just seemed to stand out as a title that had little to compare with. At this point, I had no idea what the story behind the project wanted to tell, why the monster was around or what the goal of the game was, ultimately. Then came a post from the developer whom detailed the changes to 'Monster', that came about after some discussion with a friend about the subject. 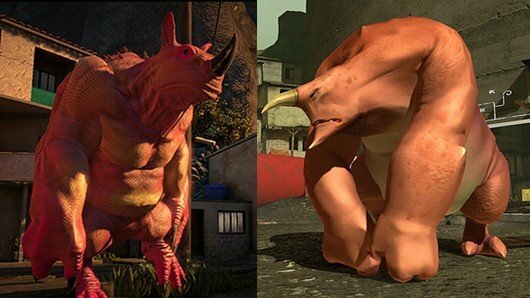 A number of gamers, including myself, didn't seem to understand the need for the changes as the new Monster looked much less a childhood friend (and even model quality wise, it was of lesser detail) and expressed such feelings. Vander Caballero, director and mind behind the entire story, idea and project (along with Montreal based developer, Minority) shared with the community that the change made a lot of sense to the core values of the game, assuring gamers that they would 'get it' once they experienced the game for themselves. I thought back to this response when I finished Papo & Yo and now completely agree. At the beginning of Papo & Yo, Caballero dedicates the project to his Mother and Sisters for having survived the Monster inside his father. Not exactly sure what that meant, I read into it a little more (online) and learned that the project centered around Caballero's childhood, growing up with an alcoholic father. With that under my belt, I started into the game. You take control of Quico, a young boy whom seems to teleport himself from a closet, into this world of run down shacks that sort of resemble a town, which is completely void of other people; except for Monster, a large red being whom pokes around the levels looking for stuff to eat and occasionally a girl the same(ish) age as Quico, whom drops hints and gets you to do things for her. Most levels play out having you do some light platforming and more heavily gets you to solve environmental puzzles that more often than not have sort of 'other worldy twist' on them; getting you to lift entire buildings, create stairs by ripping them out of walls or even stacking buildings together to form bridges. If you're not solving puzzles within the environment, you're trying to get 'Monster' to do your bidding. You'll need him to hit pressure switches, trap him in areas to progress and over all just bring him along from point A to B. This isn't exactly easy, as he only responds to food... and Frogs. A yellow fruit satisfies him, a Frog (if eaten) sends him into a flaming rage (this is better explained later) and a blue fruit makes him throw up the frogs, ending his rage streak. This is used somewhat, but less than I would of likes in the whole scheme of things. A bridge made of small buildings? Ehh, why not? Be they environment puzzles or those involving Monster... or even both as some of the later levels have you shifting between the two quite regularly, each effecting the other; they seem rather thought out, but a little too cut and dry and thus not overly challenging. I would of liked a little more challenge, a little more of that "sitting back and thinking about what to do" rather than just "Okay, there's a switch for that, I know what I'm doing", kind of set up. Thus, the main aspect of the gameplay is merely adequate. The platforming is painful as it feels like you should have so much more freedom as a character... but are quite limited to an almost real world physics system. You do gain the ability to double jump/glide a short distance once you meet your robot friend Lola, whom too opens up a few new ideas for puzzles, but for the most part, you're running around tackling the puzzles aspect of the world. In this regard, it's not a terribly exciting game, but it's interesting story is what redeems this title. As noted above, the main theme of this project is that of growing up with an alcoholic father. Without giving away much (it's much better to experience it, trust me) you go through the game's 5 acts (each with a number of levels each) and learn various things about 'Monster', what connection it has to your character Quico, your Father and your two friends (the girl and robot). 'Monster' himself is a bit of complex creature, even if you're merely interacting with him via thrown food and he does not talk. Interestingly enough though, the team behind the game have made him a creature that can be both a nice aspect of the game, someone you seemingly can trust and at other times, he can become a very scary aspect of the game, something you almost want to avoid. It's a dynamic they play with a lot. Ultimately, the game will hint at the main idea at certain points, but won't come right out and bluntly say it until the very end. By that time you'll have exhausted the game's play mechanics, but enjoying the journey it took you though. It's a title that won't win any awards for it's game design, but is quite worth the cover charge for it's thought provoking theme; including it's character design, story and emotional themes. A little rough on the technical specs, but charming in it's art style and music. 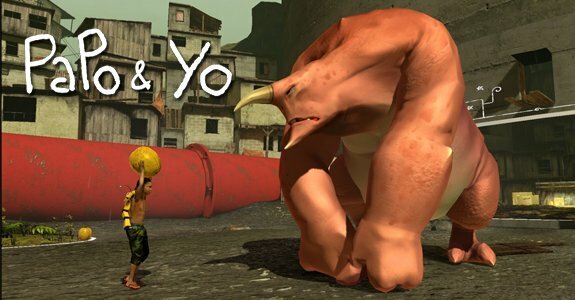 Papo & Yo is an example of a smaller indie project (funded by Sony's Pub fund initiative that offers smaller studios help to get their games on PSN) with it's strength lying in it's emotional ties and desire to weave a story, inviting gamers to think on the aspects rather than blow through a title for a high score or bragging rights.